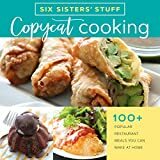 Copycat cooking with six sisters' stuff : 100+ popular restaurant meals you can make at home / Six Sisters' Stuff. Publisher: Salt Lake City, Utah : Shadow Mountain,  2018Description: vii, 198 p. : color ill. ; 23 cm.ISBN: 9781629724430 .Report number: BN-Fall 18Subject(s): Cooking, AmericanGenre/Form: Cookbooks.Summary: The popular Six Sisters’ Stuff bloggers come to the rescue with a new collection of more than 100 easy-to-make recipes of popular restaurant dishes and takeout favorites for busy families. Make meal planning a breeze as you mix-and-match side dishes from one restaurant with main courses from another and finish it off with a dessert from a third. Save money while spending more time with your family. The popular Six Sisters’ Stuff bloggers come to the rescue with a new collection of more than 100 easy-to-make recipes of popular restaurant dishes and takeout favorites for busy families. Make meal planning a breeze as you mix-and-match side dishes from one restaurant with main courses from another and finish it off with a dessert from a third. Save money while spending more time with your family.